OMG – the 10 most WTF BGT auditions! It might feel like you’re still recovering from The X Factor but resting time is over; Simon Cowell is back with Britain’s Got Talent. That’s right, the tenth edition of the talent show competition will begin tonight on ITV. Earlier in the year, the judges scoured Britain to find weird and wonderful acts that could be entertaining the Royal Family at this year’s Royal Variety Show. Amanda Holden and Simon Cowell will be returning for their tenth series as judges, whilst Alesha Dixon and David Walliams return for their fifth. Ant and Dec are, of course, hosting the show and the golden buzzer is also making a return. This precious buzzer allows each individual judge and the hosts (combined) to catapult an act straight to the live semi-finals. So prepare to spend your Saturday nights hearing R Kelly’s “I’m the world’s greatest” as the soundtrack to a young boy’s attempts to make his pet chicken recite the alphabet in French. Throughout the 10 years BGT has been on our screens, we’ve seen a whole host of bizarre and breathtaking auditions. Here’s just a handful that made us go… OMG WTF BGT?! 1. Siblings Billy and Emily England gave everyone heart palpitations with their daring roller skating routine. There must be a great deal of trust between these two, considering how close Emily’s head gets to bouncing off the ground. 2. Siberian dance troupe UDI mesmerised the audiences and the judges with their playful routine. Their use of light was entirely unexpected and had the audience in the palm of their hand. 3. 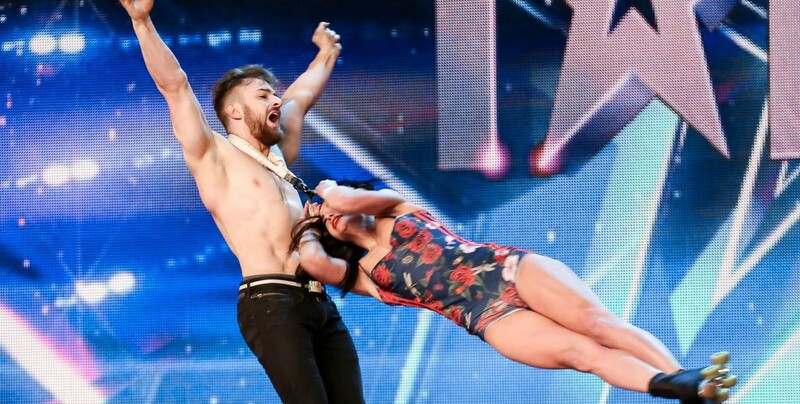 The joy of Britain’s Got Talent is the diversity (geddit?) of acts. You just don’t know what to expect when someone walks out on to the stage. This Lee Evans-esque comic did something entirely unique which may not have wowed the judges straight away, but had them in stitches by the end of his act. 4. When this group of five dads walked onto the stage in their knitwear and slacks, you could almost hear Simon Cowell roll his eyes. However, when that beat kicks in… what follows will tickle your funny bone and warm your heart. 5. It’s notoriously difficult to impress Simon if you’re a magician, but Jamie Raven manages it. With his impressive close-up card trick, he renders Simon speechless. That is no mean feat. 6. The animal acts always put us on edge – there’s just so much that could go wrong. Marc Métral and his dog, Wendy, silenced any doubts with their incredible act. How does he do it?! We’ve looked and looked but we’ll just have to conclude that this dog can talk. 7. This death-defying magic trick seriously made us scream WTF, along with the entire audience by the looks of things! 8.Warning: watching this clip will guarantee this will be stuck in your head for the rest of the day. Who can forget this classic rap song from Zipparah in 2012? Let’s not forget that putting Mr Zip and his memory issues aside, Pudsey the dog won the competition this year. Come on Britain, get it together. 9. Continuing with the canine convention, Pip and her pooch pal, Buddy, auditioned in 2011 and left many of us with our mouths wide open in shock. We’re still trying to decide if it’s good or very very bad. 10. 2013’s winners, Attraction, took everybody’s breath away and moved many people to tears with their first audition. Their thoughtful and heartwarming performances were visually stunning and practically guaranteed them that spot on the Royal Variety Show. Britain’s Got Talent airs tonight (09.04.16) at 7pm on ITV.